Definition at line 3965 of file Messages.h. Repeating group containing Entry entries. Definition at line 4366 of file Messages.h. Definition at line 3970 of file Messages.h. Definition at line 4369 of file Messages.h. Definition at line 4374 of file Messages.h. Total number of messages contained within batch which is defined by match event indicator (5799). Definition at line 4406 of file Messages.h. Definition at line 4425 of file Messages.h. Definition at line 4432 of file Messages.h. 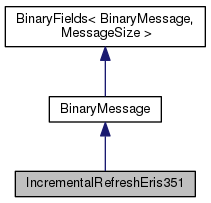 Returns instance of Entries repeating group. Definition at line 4416 of file Messages.h. Definition at line 4439 of file Messages.h. Bitmap field of eight Boolean type indicators reflecting the end of updates for a given event. Definition at line 4397 of file Messages.h. Start of event processing time in number of nanoseconds since Unix epoch. Definition at line 4387 of file Messages.h.